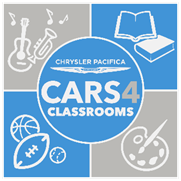 2/23, Roanoke, IL - On Saturday, March 10th, during the hours of 12:30pm and 3:30pm, Roanoke Motors will host a Chrysler Cars 4 Classrooms fundraiser for Metamora Community Grade School students. During the Chrysler Cars 4 Classrooms event, parents and friends of the school, will have the opportunity to earn a $10 contribution, up to $2,000, for Metamora Community Grade School students, by taking a brief test drive in the all-new Chrysler Pacifica and Pacifica Hybrid – the only hybrid minivan available on the market. Any licensed driver, age 18 or older, may drive and earn $10 on the school’s behalf. Roanoke Motors will provide vehicles and staff to assist drivers with fundraising test drives and any questions they may have. The Chrysler brand will also offer Metamora Community Grade School a chance to earn an additional $1,000 and be entered into a grand prize sweepstakes for up to $7,000 in additional funding, by simply sharing photos from the event on a public Facebook account within one week of the fundraiser’s date and incorporating the provided customized hashtag #MetPacificaContest for Metamora Community Grade School and tagging @Chrysler. The contest ends 3/17/2018. Additionally, all test drive participants will be entered into the 2018 FCA US National Sweepstakes at registration, for a chance to win $45,000 towards an eligible vehicle from any one of the Chrysler, Dodge, Jeep®, Ram Truck, and FIAT brands. In 2017, the Chrysler brand celebrates 25 years of commitment to its local schools and families. Since 1993, the brand helped to raise over 7 million dollars through fundraising test drives. For more information, visit www.cars4classrooms.com.